Please scroll down to read and click tab. 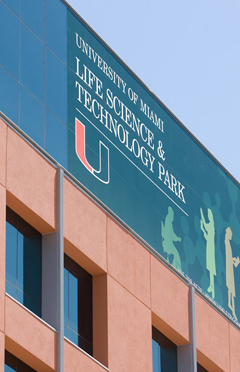 Management of the University of Miami Life Science & Technology Park (“UMLSTP”) reserves the right to limit the use of conference space to those organizations sponsoring programs that are consistent with the UMLSTP’s mission of promoting life sciences research, technology commercialization, and community affairs. The maximum capacity of the two conference rooms combined (A & B) is 66 persons. Reservation Procedures To reserve conference room space at the UMLSTP conference center, users must agree to abide by these Guidelines. 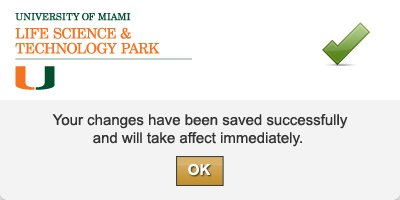 Events may be scheduled Monday-Friday from 8:00 a.m. to 8:00 p.m. and on Saturdays from 8:00 a.m. to 5:00 p.m. To ensure that other users’ meetings can begin on time, all events MUST conclude on time. Reservations are made on the website at www.umlstp.com or by calling (786) 364-6392. Once you enter your reservation through the web page where it will be reviewed by Management to confirm availability and you will receive an e-mail response approving or declining your reservation. In order to keep the room from being overbooked by any one group, recurring reservations are limited to two reservations. This does not include events spanning multiple back-to-back days. Events spanning multiple back-to-back days are limited to (5) five days. We require 48 hours notice for cancellations otherwise you will be billed for the cost of the room rental. Food Service UMLSTP Conference Center does not offer food or beverage service. All arrangements for food services, water and refreshments must be made directly between the sponsoring group and an approved catering firm (list provided on website). Only those caterers on the approved list may be used, and no sponsoring group may provide its own food or drinks for that group without prior permission. A copy of the caterer’s Liquor License must be on file with the property manager if alcohol is being served. If arrangements have not been made with the caterer to return for cleanup, then the sponsoring group is responsible for cleanup and for the removal of all trash from the building. •	The policy shall include contractual liability coverage. •	A waiver of subrogation should apply in favor of Wexford Miami, LLC. for the general liability and workers' compensation insurance policies. •	Wexford Miami, LLC. (Owner) and Taylor & Mathis of Florida, LLC (Agent) must be added as an additional insured to the general liability insurance policy. Audio/Visual equipment to be used must be specified on the Reservation Request form prior to the scheduled event. A/V assistance for and during the meeting can be arranged and you may be charged an additional fee. Please come early to the event to make sure you can operate the equipment. If you choose to bring your own equipment, there will not be an AV technician to assist you should you need help. Restrooms are located on the first level. Parking is available in the lot next to the building. Parking may be pre-paid such that attendees will be provided parking tickets that they can use to exit the parking lot without having to pay. If parking is not pre-paid by the event sponsors, each attendee will be responsible to pay their own parking charges upon exit. Coupons can be purchased from Property Management otherwise payment must be made at the Pay-on-Foot station in the main lobby, please make your attendees aware of this. Payments made directly to management must be in the form of a check. •	All outside events and non-tenant events are required to use our on premise restaurants for catering. Please visit http://umlsp.com for dining options For additional questions in regards to dining and catering contact Rosemary Staltare at Rstaltare@gmail.com. •	All trash must be removed from the building. •	Furniture may NOT be moved within or removed from conference rooms without prior permission from property manager, and NOTHING MAY BE TAPED TO WALLS OR DOORS. •	Smoking is permitted in the designated smoking area at the southeast corner of the building where the bench and cigarette urn are located. Smoking is strictly prohibited near the entrances. UMLSTP staff will provide assistance for the audio/visual equipment provided by the UMLSTP conference center. UMLSTP staff cannot assist with Lessor’s audio/visual or computer equipment. Phone service is available. Lessee is responsible for long distance and international phone charges. Arrangements to store materials, boxes, or equipment overnight should be made with the engineering staff through the security station.